Bishopdale College is the Diocesan Provider of Ministry Training. This is an ongoing partnership between the Diocese and the College which is really just the two wings of the one bird, combining ministry training for both lay and ordained. It integrates our training into a missional model which lies behind the development of the Institute for New Anglicanism. It is an exciting, but totally new paradigm in training people for ministry. Our vision was for a Coordinator to facilitate the delivery of Ministry Education and for that Education to draw upon the skills and expertise of a wide range of people both within and beyond the Diocese. We are seeking to foster new forms of leadership in the church so that we may serve God’s mission in the fast changing realities of the world in which we are placed. The Rev Dr Graham O’Brien is the Ministry Education Coordinator for the Diocese based at BTC. The funding from St John’s College Trust Board that accompanied the Ministry Educator is now used to contract BTC to enable Diocesan Ministry Education. 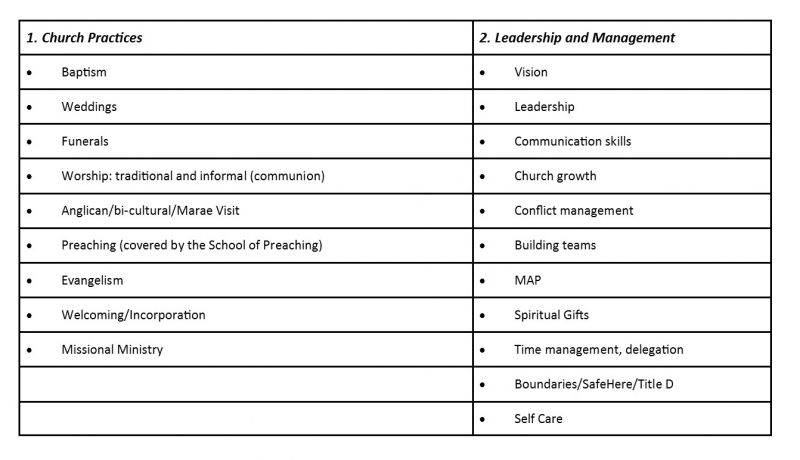 So why do we as a Diocese prioritise ministry education? Within the Diocesan Strategic Plan: Towards 2020, strategic priority 3 captures the reason that Ministry education exists: To develop confident, creative and spiritually healthy leaders across the diocese with a clear understanding of the gospel, discipleship and ministry as participating in the mission of God, reflecting a diversity of leadership styles and modes as appropriate to a range of ministry contexts, challenges and needs. The outcome of which is the identification, nurture and formation of a new generation of leaders (both lay and ordained) for fresh and reinvigorating ministry initiatives. To see existing leaders actively embracing opportunities to grow professionally for ministry with a clear sense of mission and outreach. Alongside strategic priority 3 is strategic priority 2: To Encourage and Evaluate Worship and Discipleship of the Diocese. In forming leaders, we are also forming disciples, and so the intent is to create a culture within our churches that encourages and models a selfless and obedient lifestyle amongst those who follow Christ. The outcome of which will be seen in a greater commitment and involvement in the ministry and mission of the church and increasing evidence of Christ-like Character. For Clergy ministry education involves developing a culture of life-long learning and ongoing professional development within the Diocese, that enables all licensed clergy to strategically and intentionally reflect on their ministries and embrace opportunities to up-skill. I have always found that I’ve gained a greater understanding of the subject matter of each course. I have more confidence in going out and sensitively sharing my belief on God, and I’ve found the group sessions very beneficial in gaining more skill in hands on stuff. I certainly go away from each session, really fired up and eager to watch for opportunities to use my newly acquired knowledge. In today’s context, one of the main challenges we face in leadership is the busyness and rapidly changing nature of our world. As a result, ‘yesterday’s solutions will not solve tomorrow’s problems’ (Marquardt, Leading with Questions, 2014). Leadership in this dynamic context is now focused on what questions to ask rather than about what answers to provide – a culture shift towards a ‘culture of inquiry’ or ‘questioning culture’ (Berger, A More Beautiful Question, 2014). Within Christian ministry we already have a model for this questioning shift in the words of Jesus in Matthew 19:14, ‘Let the children come to me. Don’t stop them! For the Kingdom of Heaven belongs to those who are like these children’ (NLT). Often, we look back to Matthew 18: 4-5 and focus on humility as the correct child-like quality to aspire to. However, two child-like qualities not often thought of in these words are the innate curiosity and courage of children to explore their world through questions. As we seek to grow in ministry that can adapt and adjust to change - in ourselves, and in others through identifying, equipping and enabling - may we have the curiosity and courage to ask the empowering question that unlocks new understanding as we participate in the ministry of Jesus in this world. Through ministry education, may we all let God shape and use us as we seek to participate in the ministry of Jesus in this world. Last year it was great to see new people attending EQUIP as we provided training in local parishes, predominantly in the evenings. The units that have been developed can be run over a whole day, adapted for a half day, or broken up into evening sessions (2 per unit). If your parish, cluster of parishes, or regional deanery would like to book in some training please let me know. If there are other topics you wish to cover, we are happy to prepare material for you. For a PDF of the training manual for each unit, contact Graham at ministryed@bishopdale.ac.nz. Training sessions are available online (use the links above) or as DVDs from Holy Trinity, Greymouth and St Christopher’s, Blenheim, the Bishop Sutton Library BTC, and the Anglican Centre Resources Library. The current POMD process is 2-fold. Participation in a Community of Practice (replaces or sits alongside regional deanery meetings). Find dates below. 2. 2 one-day meetings, and 1 two-day meeting (Marae visit or Bishop’s retreat). The aim for each day will be to discuss ministry competencies. The theme will be "Sharing the Gospel" and will look at skills around how we share the Gospel with others, that can also be fed into preaching. This is a great opportunity to bring others from your church who are interested in preaching and evangelism. Friday 7-9pm; Saturday 10am-4pm (lunch provided on Saturday). If you're interested in this, contact Graham at ministryed@bishopdale.ac.nz. Nb. For POMD Expectations see under Ministry Education Resources at this link. We now have the exciting development of offering a diploma which majors on internship (20hrs per week) which would be ideal for anyone wanting to do a gap year programme or gain experience in Christian ministry. Remember that a ministry intern is a training position, so the intern needs to be working under someone with experience. We offer a Level 5 Diploma of Christian Studies (Leadership) Internship. Check it out on Bishopdale College's website. 3DM is a strategy to develop a discipleship culture within groups “huddles” and congregations. Currently several clergy parishes are utilising this approach. Achievement: Establishment and multiplication of “huddles” that utilise the 3DM strategy.